Skip the dry, stale bakery cookies and make your own bakery style butter cookies! They’re perfect, buttery mouthfuls of deliciousness! Ummm…whoa! Where did December go and how did I manage to be completely absent from this space in that time? Chalk it up to 1) Riley starting daycare, 2) me going back to work (ugh! ), 3) me getting my real estate license, AND 4) me hooking up with a local office to start my new business. And then Christmas happened where we hosted the Eve and the Day and a whole bunch of family baloney went down. That’s always fun. These cookies though! They make up for all that baloney. Actually, while these bakery style butter cookies look all fancified, in reality, they’re super easy to make. If you have a little patience. Heh. No really though! The dough for these cookies is an incredibly simple butter cookie dough, not unlike these rosemary butter cookies or the indelible spritz cookies of years passed. Butter, sugar, eggs, vanilla, flour, and salt. Soooo easy right? The trickiest part about these cookies is not overthinking the size you pipe them out at. 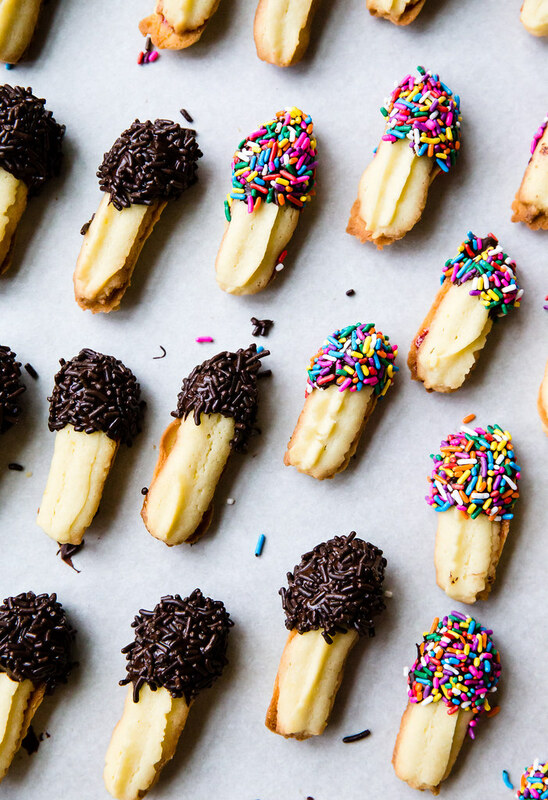 Since they’re sandwich cookies, you want the tops and bottoms to be generally the same size but let’s be real here: they don’t need to be perfect. Buuuut! Because you’re squeezing the dough through a star dip at the end of a pastry bag, you also need the dough to be soft. And I mean SOFT. So, don’t chill the dough before you’re ready to pipe the cookies unless you can give it a few hours to soften at room temperature before you start. Trust me here. I piped these cookies right after I made the dough and because [I think] my butter was too cold to start with, my hand was KILLING me while trying to squeeze the dough from the piping bag. All baked up, these bakery style butter cookies still look pretty plain. And nobody loves a plain-looking cookie! To easily remedy that, you’ll sandwich some jam between the cookies. I made half with apricot preserves and half with seedless raspberry jam. And then you’ll dip ’em in chocolate (yuuuumm!) and roll them in sprinkles. 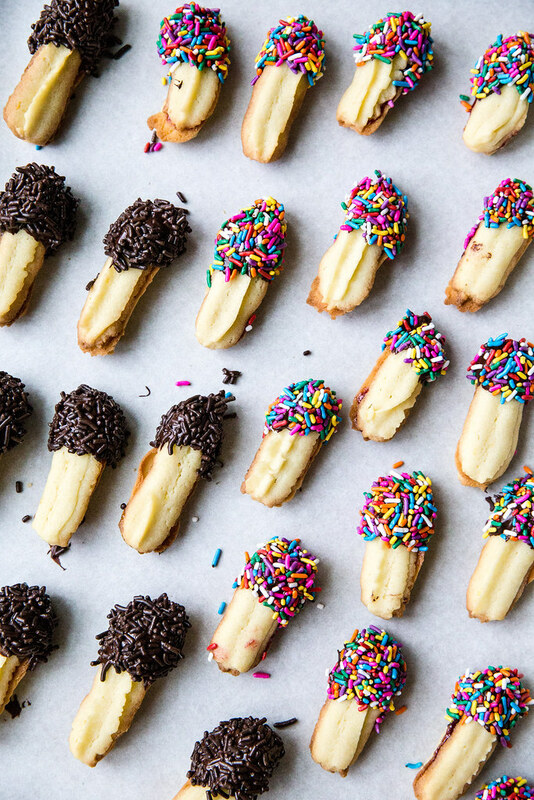 Go crazy with the sprinkles here! Got a special occasion in mind? Birthday parties: your kid’s favorite color or matching your party theme! I went with traditional mulitcolored and chocolate sprinkles cause I’m boring like that but it’s totally up to you! The sky’s the limit here! When you buy this type of cookie from a bakery, you’ll be hard pressed to get them freshly made so they’re often stale, dry, and flavorless. And in my experience, when people are faced with a bakery cookie tray, these cookies are always the first to go. How sad it makes me to know that people are eating stale, dry, and flavorless cookies. It must be the chocolate and sprinkles that lull people into this state of cookie complacency. But these bakery style butter cookies are quite delightful! They are little one-bite mouthfuls of pure buttery cookie deliciousness. 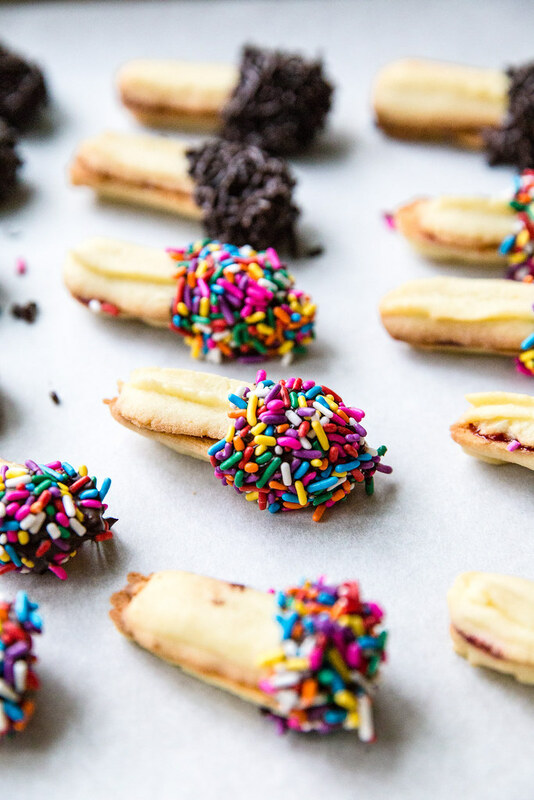 The chocolate-dipped and sprinkle-rolled ends are a complement to the cookie as a whole – not the best part of the cookie. I’m positive you guys will love these little cookies! They’re the perfect arctic chill or snowy day project cookie and they’ll make a fantastic sweet treat to help ring in the new year. Cheers!! My biggest tip about these cookies is to make sure your butter is very soft – almost to the point of being melted but still in a solid-ish state. This will help keep the finished dough soft and will make it easier to pipe the dough onto the baking sheets. ½ cup (160 grams) jam of your choice – or multiple jams! To make the cookies: Preheat oven to 350° F. Line 2 large baking sheets with parchment paper; set aside. In a large mixing bowl (either a stand mixer or bowl with a hand blender), beat the butter and sugar together until light and fluffy, about 2-3 minutes. Blend in the egg yolks, vanilla, lemon zest, and salt, and scrape down the sides and bottom of the bowl with a rubber spatula. Add the flour and mix only until it just disappears into the dough. Fit the end of a piping bag (or a zip-top bag with a corner cut off) with a medium open star-shaped pastry tip. I used the Wilton 1M open star tip here which yielded kind of narrow cookies, about 1-inch in diameter when baked. If you want big, fat sandwich cookies like you see in the bakeries, I would recommend the Ateco 866 or 868 French tip which are wider and have more teeth to give your cookies more defined ridges. Fill the bag with dough to about 2/3 full and pipe 2-inch long by ½-inch wide pieces of dough in rows in the baking sheets. Be sure to space them about 1-inch apart. Bake for 11 to 13 minutes, or until the edges are just golden brown. Larger cookies may need a few extra minutes to bake. Transfer the baking sheets to wire racks and allow the cookies to cool for a few minutes before transferring them to the racks and reusing the baking sheets to repeat the process with any leftover dough. Allow the cookies to cool completely before proceeding. 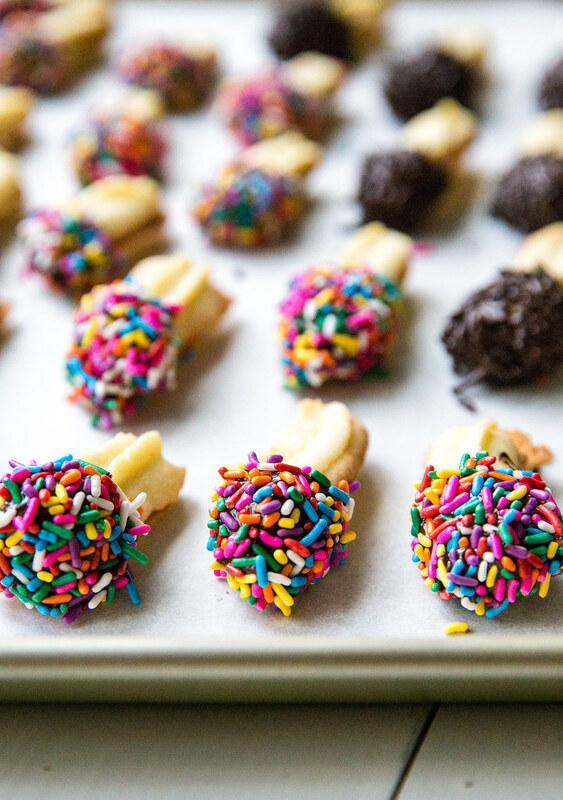 To assemble: Once the cookies have cooled completely, spoon the jam into a piping bag but leave the end of the bag intact until you’re ready to pipe it onto the cookies. 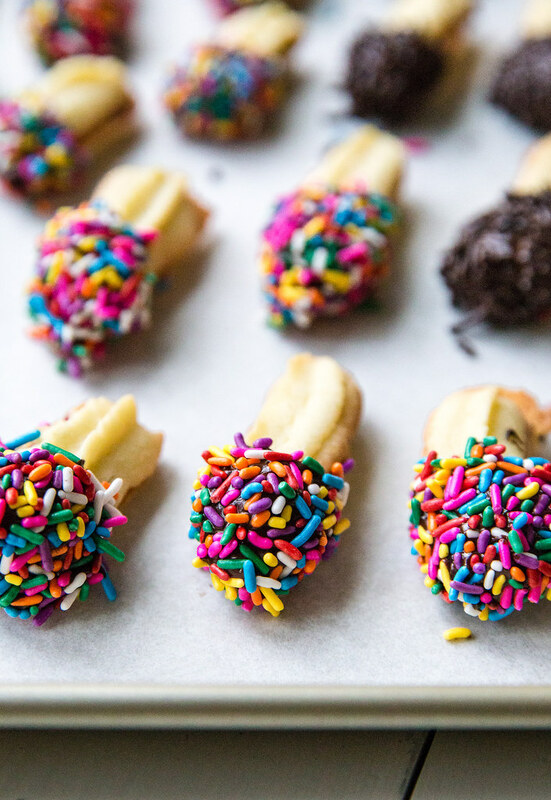 Dump the sprinkles into a wide, shallow dish. Melt the chocolate chips in a medium-sized microwave-safe drinking glass or deep bowl at 30 second intervals, just until there are a few chips still left unmelted, then stir the chocolate to completely melt all of the chips. The point here is to not heat your chocolate too much, else you risk the sprinkles sliding right off when you roll the cookies. Ready 2 large baking sheets with clean parchment paper or the previously used pieces flipped over to use again here. Match up the cookies into pairs by size as best you can, leaving one cookie in each pair with its bottom-side up, ready for jam piping. Snip off the end of the jam bag and gently squeeze the jam in a wide line down the center of one of the bottom-side up cookies. Sandwich its pair on top and press gently to seal the cookies to the jam. Dip the end of the cookie sandwich into the chocolate, allowing as much chocolate to drip off as possible before rolling it in the sprinkles to cover the chocolate completely. Place the finished cookie on the prepared parchment-lined tray. Repeat with remaining pairs of cookies.